Home » chennai news » #Chennai Floods: "We are holed up and helpless"
Mohammad Faruqi, 32, works in one of Chennai's BPO's. He lives in a ground floor home of Kodambakkam with his family. "We're lucky at in our area the water hasn't risen to a point of flooding our homes, but in other parts of Chennai where my family relatives live, its really bad," he says. Some of his relatives live in Saidapet, one of the low lying, worst affected areas. Faruqui's family who live in a two storied house there first moved to the second floor when the water levels rose, and today, when the water started coming through the doors of the second floor, they were forced to move up to the terrace. The thing that bothers Faruqi the most is the feeling of helplessness. Two days ago his friends decided to distribute food packets to families who were stranded in Adayar. Faruqi and his friends decided to hop on to their bikes and try to ride through the rising waters. When they reached T-nagar which was completely flooded until hip level water and made it to Tenampet, they were stopped by the police. The Adayar bridge was completely flooded with water going over it. "I might have lost my life if I was allowed to proceed. Its the first time in history that the Adayar bridge got flooded. 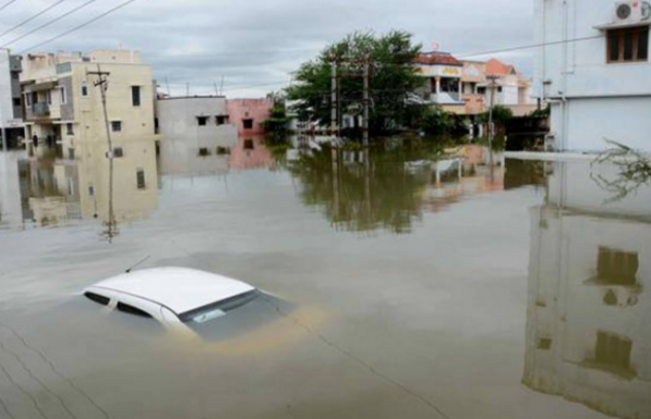 We've never seen Chennai this way," says Faruqi. His office has been shut from yesterday. Because of the lack of electricity and the loss of network, with Vodafone and Aircell completely shut down, its hard to reach people and tune into updates in the city. "My kids were intially happy that they don't have school but now I can see them starting to get psychologically affected with so much panic all around," says Faruqi.